I am becoming weirdly obsessed…….I know what else is new?! ?………..with antique church artifacts. 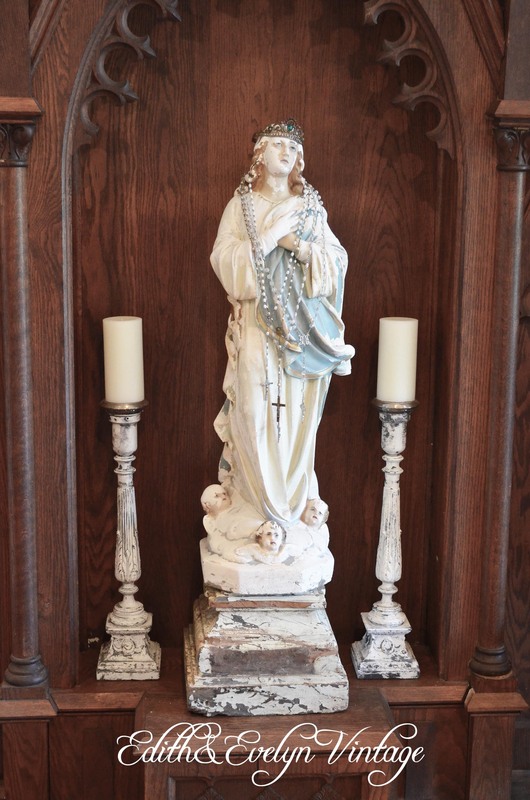 I seem to be finding them more and more frequently……or as I like to tell hubby, “They are finding me!” We found this fabulous antique church altar a couple of months ago when we were at our favorite monthly estate sale in Mobile, AL. I didn’t have a clue as to how we were going to get this monstrosity home, but I just knew it was supposed to be mine. As luck would have it, our friend that owns and hosts the amazing monthly estate sale was going to be traveling to Illinois to pick up an estate they had purchased. So he was going to be going through our neck of the woods with an empty truck! Voila! All we had to do was meet him and transfer this beauty to our truck! Which we did last week! Once we got it home, hubby and I wrestled it out of the truck and into the garage. Both of us stood in front of it with our hands on our hips, breathing heavy from exertion…….wondering where in the world we were going to put it! We finally decided that there was really only one place in our house that it could go, and it doesn’t really work there, but I just couldn’t leave it in the garage. So a couple of days ago, we wrestled it again. It had to come in the front door because of it’s size so out of the garage and around the sidewalk to the front door……did I mention that it is solid oak? Yes….heavy oak. We stopped traffic. The neighbors stopped mowing their lawn. Children point their fingers. But our neighbor (the one that stopped mowing his yard) came and offered to help carry it inside……thank.the.Lord………..I’m sure he wanted to get the inside scoop! Once inside, I tried to explain to Mr. Neighbor that these kind of things just sort of find me and I really can’t leave them, that they call to me, and that…..yes……I am becoming. weirdly. obsessed. Mr. Neighbor nodded….as he casually….slyly….. covertly looked around the room taking in several other pieces that have “found me”……..
Like this little altar boy chair. It found me about a week ago and really needed to come home with me to sit by this altar. I am not a dark wood person, and I have been steadily trying to lighten up my home. I love painted furniture……don’t shoot me…..I’ve always loved it, even before it was trendy. So most of my furniture and upholstery is slowly getting “lightened”. However, this altar and chair will be remaining just as found. I won’t touch that wood…..although the chair is going to get some new upholstery. I placed a beautiful old plaster Mary statue in the niche, and even though she is quite large, it dwarfed her. So I placed her on top of an old antique salvaged column capital. It’s actually for sale in the shop, if it sells, I will have to figure something else out! On each side I put two altar candlesticks………I actually made these out of vintage mid century candlestick lamps. There are so many of those old lamps at yard sales, flea markets, etc that are pretty cheap. I just gut the electrical out of them, use JB Weld to “weld” them back together, paint and shabby them up, place a candle “holder” on the top. In this case I used vintage crystal coasters, they are the perfect diameter to hold a pillar candle. The end result is fabulous “faux” altar candlesticks! Mr. Neighbor finally left, I’m sure running to get home and tell Mrs. Neighbor (names have been changed to protect the innocent) what the crazy people next door were up to! Traffic finally moved on, and hopefully we were able to brighten someone’s day with new and interesting topics of conversation! I love these storied religious pieces and strangely, they do seem to be around every corner! Something about them pulls me. There is a beauty to them that calms my soul. Some stay with me, some go into the shop to sell. I always hope that when a piece sells, that the buyer sees the same serenity and beauty that I see, that it calls to them too. Hope you have enjoyed this peek at my weird obsession……I should say one of my weird obsessions, because I’m sure there’s more! At least according to some people……..whom shall remain nameless! Will I keep the altar and altar boy chair? Or will I sell it? I don’t know. I think I will probably have to live with it for awhile, enjoy it’s beauty, hear it’s stories……and then maybe I will sell it and let it go to another home. Maybe. One thing is certain, I will probably never run across another one……but then again…….they do seem to find me! « Farmhouse Cottage Chic Table……Is That Even a Decor Style? Yes, Jan, I can feed my obsession and buy something, live with it for a little while and then I’m ok with letting it go to a new home…..usually when something else comes along to take it’s place! That’s the beauty of only buying what you love and would have in your own home! Loved the feature in Vintage Style magazine! The photos were beautiful! Needs to be framed! Stay Up to Date! Get the latest delivered right to your inbox!